Despite her popularity I have never really looked at CorneliaParker’s work in as much detail as it perhaps deserves; until now, that is! It seems logical that on my quest to research artists that use the everyday in their work that I would have written more about her compressed wind instruments, exploded shed, unravelled spoon, deconstructed silverware and other works in which Parker transforms ordinary objects into something unexpected or compelling. 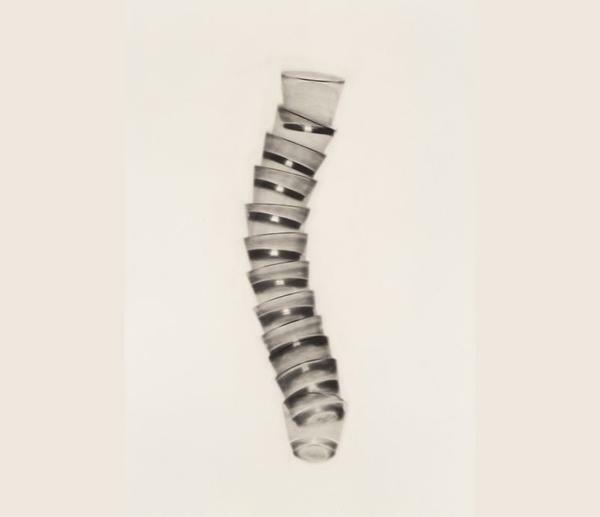 I’ve seen her work in several places, so overcoming my reluctant adversity to the obvious I visited ‘One Day This Glass Will Break’ as part of entry to the exhibition,‘Women with Vision’ at the RWA in Bristol. 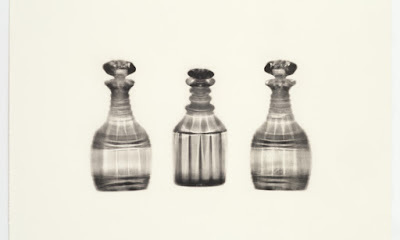 The exhibition features approximately twenty prints of various sized and arranged glass vessels that have been photographically captured on paper using a process inspired by 19th Century photography pioneer, William Henry Fox Talbot; whose experimental techniques we learn in this exhibition, have had a significant and reoccurring influence on Cornelia Parker’s practice since the 70s. The objects in these images selected because of photos Fox Talbot produced featuring a similar subject matter and compositions of objects. Cornelia Parker's images to me look like drawings, they are charcoal black and hazily soft whilst holding a weighty sense of definition, so that the cut and characteristics of each glass vessel remain visible. 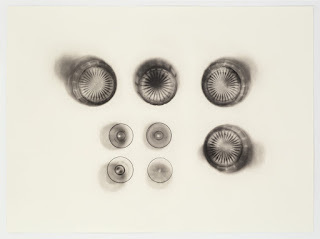 It was almost surprising to discover that they were photographic positives, created using a process called photogravure and solar printing which are loosely, as I understand it, made when objects are placed on a plate and exposed to ultraviolet light to create a positive image of the light that travels through a glass vessel rather than of the physical vessel itself… Clever stuff! For me, it is a philosophical reminder of the dichotomy between the illusion of objects reproduced in 2D processes and their physical known reality; I have always found the illusion of the thing to reveal more of an understanding of its shape, form, weight and ‘existence’ in terms of how we perceive it, far more than the placing of the actual object on a plinth for consideration. 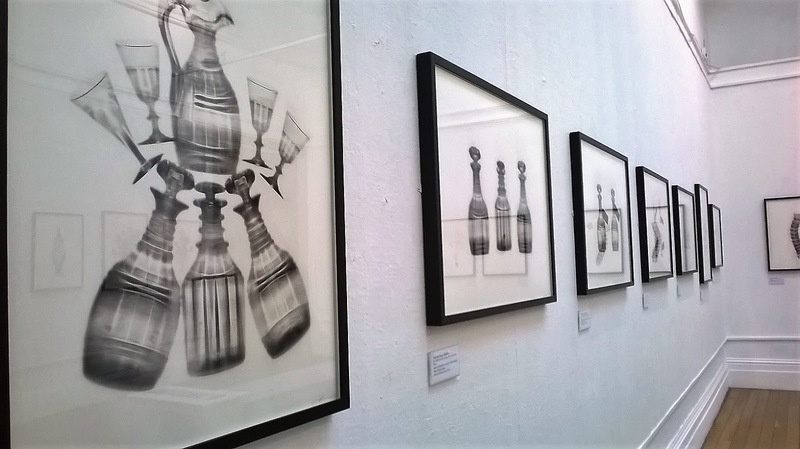 Whilst shadow, X-ray or ghost-like, the glass jugs, decanters and bulbs in this series of prints are a manifestation of the void spaces within objects rather than the thing itself and are in-fact an attempt to capture the image of light that passes through. Negative made positive in an almost RachelWhiteread-like move but without the literal physicality of turning negative space into a solid; these are turning a negative space into a photographic representation of a solid! There is a second layer of mental gymnastics if one also considers what the presence of the glass through which we view the image of the glasses does to how we interpret it, i.e. can we ever see an image clearly if through glass with all its reflections? The plot thickens! Cornelia Parker’s work often literally flattens objects, such as the trombones in the wittily titled, ‘Breathless’, so it is interesting here to see that process is used again but taken into a flattened representation and trace of the original object itself; sometimes from unusual or unfamiliar angles such as the view of the underneath or bottom of a glass or of several shot glasses stacked within one another (pictured). For personal reasons I was particularly drawn to how the image opposite looks like an X-ray of a spine. These alternative, flattened and groupings of objects are unexpected and amusing; in some ways I think they almost create a sense of animation or potentiality to their expected static presence. Parker’s work has often been likened to using actions of cartoon-like violence in their creation; other prints in the exhibition demonstrate this with explosion like areas of splatters and blots created from the artist spitting tequila onto a prepared photo plate. An abstract expressionist meets punk form of expression that turns something repulsive and aggressive into something arguably beautiful but also echoed in the title with the implication that these things will break (by age or by violence? It is left to us to decide). These double-meanings through the production, titling and execution are present in many of her works. Ironically the glasses in ‘One Day This Glass Will Break’ as images will never break, as such, immortalised by the photographic process. The original ones of course will eventually age, decay and break. In that way these images share something with museum-style preservation with some images even composed in a way that includes identification tags on some of the glasses. The vessels become metaphorical shadows that are both twin and opposite of its original, they represent the relationship photography philosophically has with capturing a moment in time as associations with death and mortality. 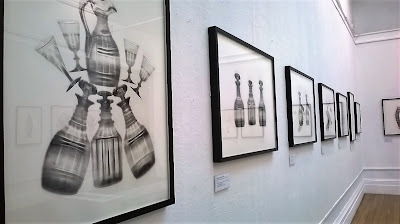 The title of this post, ‘through a glass darkly’ refers to the idea that we have an obscure or imperfect vision of reality which to me seemed to fit with the ideas of 'what is real' and 'what is not' at play in these prints and the literal take that the prints exhibited in ‘One Day This Glass Will Break’ show glass which is dark, rather than light and transparent. Those were at least my initial thoughts into this body of work, maybe in time I will see things more or less clearly.